Nuala Woulfe Beauty: Introducing HA Intensifier by Skinceuticals. 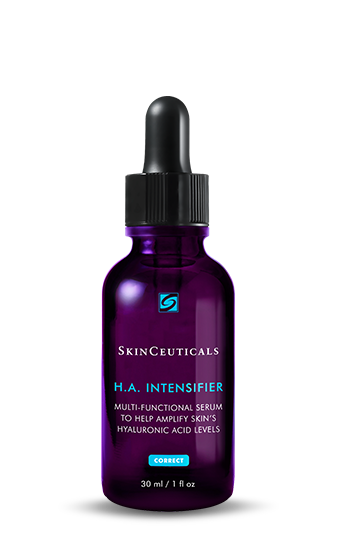 Introducing HA Intensifier by Skinceuticals. Hyaluronic Acid (HA) plays an important role in your skin’s overall appearance and well-being. What does HA do for my skin? HA is a naturally produced humectant - helps to regulate moisture levels in the skin to keep your skin hydrated.Your skin naturally produces HA, but your skin’s natural HA production declines with age starting around your 20s which contributes significantly to signs of ageing. Why is SkinCeutical’s H.A. intensifier different from other products on the market? •Most products containing HA help on a surface level to provide moisture, which provides temporary results but SkinCeutical’s H.A. intensifier takes it step further. This formula helps encourage your own natural production of HA, Usually with HA gels or serums you have the HA which is fragmented or encapsulated but it only works in hydrating the skin, it can’t replace the declining HA that you lose in the dermis with age. This product contains several ingredients to not only hydrate with hyaluronic acid but also to stimulate HA production and to slow down the degradation of HA. Three types of hyaluronic acid – full molecular weight, fragmented and encapsulated chains – to provide long lasting hydration to help improve the look and feel of dry, rough skin. What are the ingredients in the H.A. Intensifier and how do they work? 10% Proxylane, a proprietary ingredient, to support hyaluronic acid levels and help maintain the integrity of the skin's matrix, for improved firmness (Pro-Xylane -according to research, it is a sugar-protein hybrid made from xylose, a sugar found abundantly in beech trees and known to stimulate the production of glycoaminoglycans (GAGs), molecules responsible for defending the skin against water loss. Who should use the H.A. Intensifier? It’s a super lightweight serum/gel, You can apply it after a SkinCeuticals antioxidant and follow with up with your favourite SkinCeuticals moisturiser and SPF as required. The H.A. 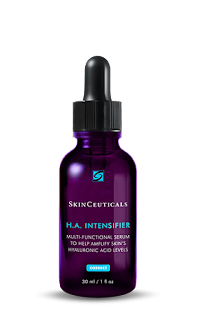 Intensifier is a multi-beneficial formula containing a high concentration of pure hyaluronic acid (HA), Proxylane, and purple rice extract to support skin’s natural HA reservoir to help renew plumpness, elasticity, and firmness. The appearance of crow’s feet, nasolabial folds, and marionette lines are reduced, and a taut and smooth canvas is formed to help refine skin’s complexion. As part of an at-home skincare routine, H.A. Intensifier can be paired with an antioxidant, sunscreen and other moisturisers in the SkinCeuticals Corrective portfolio to tackle multiple anti-ageing concerns.